It’s been awhile since our last ID Challenge. I’ll give 2 pts each for correctly naming the order, family, genus, and species and whatever supporting information you can provide. Bonus points if you can surmise host plant, location, etc. Standard ID Challenge rules apply. No trick questions this time – it’s just about the bug! And two thrips are thrips. Split an amoeba and you’ll get amoebae. Species is and species are, too. Amoebas can be, but thrip or specie will not do. As for the plant, I’ll have to mullein that over for a bit and get back to you. A thrips is a thrips, and thrips are thrips. Your little diddy was so delightful that I’ll overlook the absence of the word “Thysanoptera” and summarily award a total of 4 pts. Not Orthoptera, and not a nymph. However, I don’t like to see anyone walk away empty handed, so you get a point just for playing. Well, it’s certainly pretty minute (it has all the features of a high-magnification image). I know you’ve got an MP-E lens, so if it still came out a bit blurry it’s probably 1 mm long or less. Underside of some kind of moderately hairy semi-succulent plant leaf – maybe spinach or lettuce? Is this on some leafy greens that you bought from a market? On some greens from the grocery store. On the other hand, nice deductive reasoning regarding the size (I think you’re learning well how to play this game), so I’ll give you another 2 pts for a total of 6. This moves you into a 3-way tie for the Session #2 lead with Dave Hubble and HBG Dave. Woohoo! That was a near thing, I’d never seen thrips before, and almost slipped up and called it a fly (before working out that it was probably only a millimeter or so long). The whole grocery greens thing was an afterthought, I just thought it would be amusing if it turned out to be true. Fringed wings make this a thrip (Thysanoptera = Greek for fringed wing). But wouldn’t be surprised if it was C. fasciatus or another species. I will guess that the host plant is soybean, Glycine max. Yes on all counts – a clean sweep on the ID and 2 pts for the plant give you 10 pts and put you right back in the thick of the competition for this session. I’d say Orthoptera, but I don’t think I’ve ever seen one this small. Not Orthoptera, and I don’t think there are any this small (~1 mm in length). However, as with Christy, you get a point just for toeing the line. It looks like Thysanoptera, Aeolothripidae, Aeolothrips, an adult winged banded predatory thrips. It’s basically the only thrips with the banded black-and-white wing pattern. Franklinothrips vespiformis doesn’t have the same banded pattern. 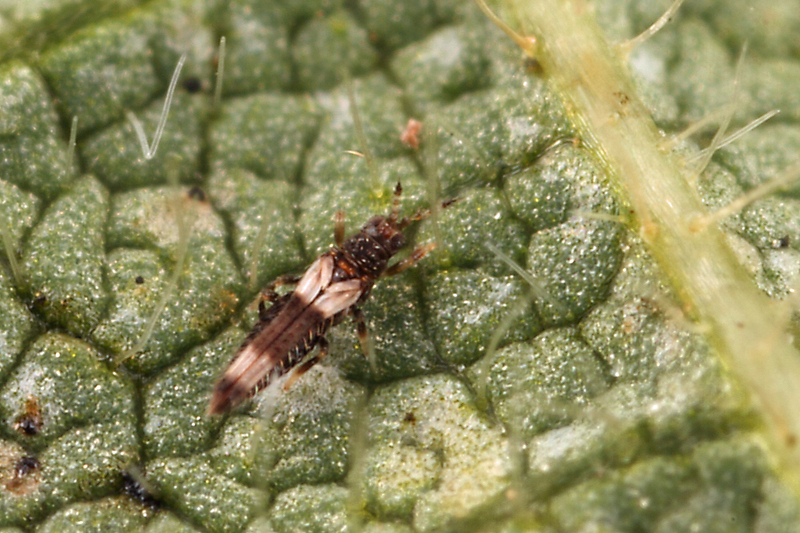 It looks like this thrips is on… a leaf. Is it a composite (Asteraceae)? I don’t know my plants, but thrips seem to like them. I was just exulting with one of my friends today about the grammatical oddity of the word “thrips”: the singular and plural forms sound the same, but the singular sounds like it’s plural (Friend’s response: “Okay, that’s very nice.”). Also, I would speculate that “Aeolo-” in the family and genus name refers to Aeolus, the Roman king (not god) of the winds, who loaned the bag of winds to Odysseus in the Odyssey and released them at the behest of Juno in the Aeneid. That prefix would be appropriate considering how winged forms of thrips disperse on the wind. Certainly Thysanoptera, but this is a phytophagous member of the Thripidae and not one of the predaceous species. Still, your info on Aeolus et al. was so interesting that I’ll give you extra pointage for a total of 4 pts. All thrips look alike to me, but based on the head shape, antennal shape, wing margin hairs and bands, this is certainly a thrips: Thysanoptera. A common name would be banded thrips. Unfortunately, whatever the function may be, banded thrips tend to be, well banded, and bands occur in more than one family. Since Ted asks for host plant, and what looks like thrips feeding damage is visible on the leaf, this possibly is the poinsettia thrips Echinothrips americanus Morgan, 1913 (Thysanoptera: Thripidae). Most of the images that I have found for this pest, however, show a distinct white band only at the base of the wings. A poinsetta could be the host plant, but my impression of poinsetta leaves has a different green, smoother, and not so hairy surface. So, perhaps this a species of Aeolothrips Haliday (Aeolothripidae), also called Banded Thrips. These are predatory on other small insects including thrips such as Frankliniella occidentalis (Perg. ), Thrips tabaci Lind. and mites (any of which may have caused the damage), but also eat wind-blown pollen. Almost all the research is on their role as predators in agricultural situations, and since Ted works on soybeans, I’ll guess soybean for the plant and the texture and hairs look bean-like. There are about 80 species in Aeolothrips and 31 in North America (according to the Kaufman guide). Aeolothrips fasciatus (L.) has been found on alfalfa in southern Alberta (Harper et al.1990 – not the Prime Minister and mispelled as “fascicatus” in Biosis) and is widely distributed according to Steve Marshall’s Insects, so maybe it will one day show up in the HomeBugGarden. A. intermedius is another species commonly reported in Europe. I’d rather see an Aeolothrips fasciatus than an Echinothrips americanus any day, so that’s what I vote for. If I’m wrong, I have the consolation of having learned something about some thrips. Harper et al. 1990. Effect of swathing and clear-cutting alfalfa on insect populations in southern Alberta, Canada. : Journal of Economic Entomology 83: 2052-2057. Consider me consoled – other than feeling dumb for not Googling ‘bean thrips’. Besides, I cleaned up at Catelogue of Organisms on another thrips and only earned 3 pts!